Though she may not admit it to its fullest extent, there are times when Brandy greatly misses her old brunch companion, Bunny. For instance, every time she sees an interesting Eggs Benedict on a menu, her first instinct is to call Bunny. "Can you believe they're putting onion relish on this thing?" she'll laugh, more often than not to Bunny's voicemail, since Bunny is rarely in a place where mobile phones can operate as normal. Something else that always reminds Brandy of Bunny is chai masala, that beautiful blend of Indian spices that most of the Western world associates with fall time tea beverages from their local coffee houses. Bunny once made Brandy a pot of chai tea completely from scratch, using the recipe a childhood friend had given her. One sip of that tea and Brandy knew she and Bunny were bonded for life, for the spicy mix of ginger, cinnamon, cardamon, and cloves warmed up every part of her, including her heart. Perhaps this is why when Brandy recently discovered a Chicago based Indian spice company called Indian as Apple Pie, her very first thought was about chai. Indian as Apple Pie carries a line of 8 custom spice blends, meant to make Indian cooking not only accessible, but simpler for both experienced and novice cooks hoping to create authentic Indian cuisine at home. Their Chai Masala Blend is the perfect aromatic mix of finely ground spices, ready to be used not only in your tea, but also for things like spice rubs, baking, or even ice cream. Though she usually associates chai with fall, Brandy decided to try and create something a little more summery and tropical with this spice blend, something that might lend itself to a sweet breakfast indulgence. Remembering an old favorite from her own childhood (which her mother referred to as "puffy pancakes"), Brandy reworked the recipe to create the ultimate celebration of chai masala and the friend who introduced her to it so long ago. The writers of this blog were provided with product free of charge for the purposes of writing this post. In a medium sauce pan, add the water and sugar and boil on medium high until all the sugar is dissolved and begins to take on a golden brown color. In a small bowl, add the Chai spice and vanilla extract to the cream, then slowly add to the caramel a little bit at a time, making sure the cream mixture is fully incorporated and not seizing up the sugar before adding more. Once all the cream mixture has been added, turn off the heat and add in the salt. Let sauce cool, then store in a glass container or squeeze bottle. In a large bowl, mix the eggs, milk, sugar, salt, and Chai spice. Add the flour slowly and combine for a smooth batter with no clumps. Let the batter sit at room temperature for 30 minutes. Preheat the oven to 475 degrees. Add 2 tablespoons of butter to each of two 9 inch pans (cast iron skillets, pie tins, or cake pans will do nicely) and place the pans into the heated oven for a minute or two, or until the butter is completely melted. Remove the pans and swirl to coat the sides with the butter, then split the batter between them and put back into the oven for 10-15 minutes, or until the sides of the pancake have puffed up and the center isn't liquidy. Once cool, remove from the pans carefully and plate. Mix the sliced bananas with some of the caramel sauce, then put them in the center of the pancakes. Sprinkle with toasted coconut and serve immediately. *Optional toppings: finish the pancakes with a sprinkle of powdered sugar or a scoop of vanilla ice cream. Perhaps one of the reasons Brandy is able to stand the bitterness of a Chicago winter is that for a short time in her life, she actually served as a Canadian Mountie. The position came about completely by accident (Brandy was spending some time in Calvary while seeing a rather famous hockey player and somehow signed up with a recruiter while a little tipsy at a party, thinking the man was actually asking her to sign up for horse riding lessons), but she rather enjoyed her time in red none the less. "Being in a position of authority like that was quite interesting," she recently reflected, "My station wasn't heavily populated, so I ended up spending most of my days breaking up fights between a herd of caribou." One thing Brandy acquired during that time was a taste for the magical Canadian dish known as poutine. Since moving to Chicago, Brandy has been over joyed to find a variety of poutines being sold everywhere, from the fanciest restaurants on Michigan Avenue, to the diviest bars in the South Side, most of which seem to be geared towards the breakfast crowd. "I'm not sure why Chicago looked at a pile of French fries and cheese curds covered in gravy and decided that was appropriate breakfast fair," Brandy has said, "But I'm not going to complain either." With a deep love for this King of junk foods, Brandy definitely took notice when the Canadian franchise known as The Big Cheese Poutinerie decided to open their first US location just a short jog away from Wrigley Field. The chain featured a variety of poutines outside of the traditional one, even offering to make any of their menu options with sweet potato fries by request. In fact, once finally stopping into the narrow, quirkily decorated location, Brandy was so overwhelmed by choices that she decided to space out her options by trying one item each day for a week. Day 1: The Scottish Curry. This poutine appealed to Brandy's heritage as a take-away loving Brit, which is perhaps why she decided to dive in with this one first. The fries and cheese curds were here, but instead of a traditional gravy, this mound of starch and melty dairy was covered in a thick British style curry sauce, pulled chicken meat, and green peas. The curry sauce was spiced without being too spicy and matched weirdly, yet perfectly with the cheese curds. The peas served to add a nice splash of color, though not a lot of flavor, and the chicken was surprisingly tender. "I don't know if Canadians would go for this one," Brandy commented, "But I think the majority of the pub going population of London on any given night would campaign to make this their national dish." Day 2: The Cheese Burger. Turning an American tradition on its head, this poutine came topped with fresh tomatoes, ground beef, cheddar cheese, two pickle slices, and a "secret sauce" that tasted suspiciously like Thousand Island dressing. Brandy loved the little bit of fresh sweetness from the tomatoes, the tang of the sauce, and the indulgence of the cheddar with the cheese curds underneath. "Again, maybe not the traditional Canadian poutine," she mused, "But this is truly an American classic. Hungry baseball fans would eat this one up, quite literally." Day 3: Corn Fritters. Taking a little break from the poutines (the portions of the previous poutines were so large that she needed time to consume the leftovers) Brandy ordered one of the side dishes. These golden nuggets looked unassuming on the outside, but beneath the crunchy fried exterior lurked a creamy, sweet, salty filling that served to please every kind of sinful food craving one could imagine. Brandy was surprised the morsels didn't come with some sort of dipping sauce, though they were plenty tasty enough on their own. Day 4: The Breakfast Poutine. From the moment she saw this beauty on the menu, Brandy knew she'd have to have it. This one came topped with scrambled eggs, pork sausage, smoked bacon, and a side of real maple syrup. This combination was a sheer genius mix of breakfast favors and textures, but in a way Brandy had not really seen. Here, the classic side potatoes were represented by the fries, and a mouthful of the cheese, eggs, bacon, and fennel spiced sausage dipped in the maple syrup made Brandy feel as though someone had taken everything she loves about breakfast and thrown it together in a sort of artery clogging salad. "With this lineup of ingredients, there wasn't a whole lot that could have gone wrong," she admitted. Day 5: The Dessert Poutine. Rounding out her week, Brandy indulged in this strange seeming concoction with a base of the same fries, but this time tossed in cinnamon and sugar and mixed with cream cheese in place of the cheese curds and drizzled with a caramel sauce. This decadent dish was just as grossly satisfying as it sounded, with the cream cheese melting into a sticky sauce that gathered together all the cinnamon and sugar into itself. Brandy couldn't detect any caramel flavor, per say, and she did wish it had it had a little more of a hit of salt to counteract the sweetness. Sadly, during the course of her week sampling poutines, Brandy was unimpressed with the service at The Big Cheese. The store front seemed to close up at odd times that didn't match those posted, and once when she tried to place her order in advance for pickup, she arrived to find a blank faced employee who didn't seem to know what she was taking about, thus forcing her to wait about 15 minutes while he lackadaisically prepared her food. In the end, though the service was not ideal and the presentation wasn't about to win any awards (both dine in and takeout poutines are served the same way, in a brown paper box), there was no denying the taste, or as Brandy put it, "Is it healthy? No. Is it pretty? No. But does it taste good? How could it not?" "It's time," said Brandy through the phone to Bailey. "I understand," Bailey responded solemnly, "When does the operation commence?" "Monday the 21st," said Brandy. Then they both hung up and synchronized their calendars, for they knew what was on the line. It was Hot Dog Week at Bull & Bear. As you loyal readers may remember, last year Brandy and Bailey braved their way through Bull & Bear's infamous Frank Plank, thoroughly testing each of the 5 dog concoctions before declaring their own personal favorites. As they were more than up to the challenge last year, there was no question they would be putting their expert palates to the test once again this year (for the benefit of our readers, of course) in scrutinizing a new crop of inventive red hots. Where as last year's theme was Chicago neighborhoods, this year the dogs were decked out in honor of five different US locations: New Orleans, Miami, California, Wisconsin, and Cincinnati. But before diving into their Frank Planks (a sampler plate featuring mini versions of all 5 dogs), the ladies ordered up some white sangria to cool off from the humidity, and a plate of truffle fries, which were so delicious that there nearly weren't any left to accompany the dogs when they arrived. First up was the New Orleans Po Boy, an andouille sausage topped with olives, provolone cheese, and served on a sesame seed bun. The sausage was not nearly as spicy as Brandy expected it to be, but it still had a good dose of beefy flavor, and the toasty flavor of the bun really helped to set it off. Next came the North Woods of Wisconsin, a venison dog with mustard, caramelized onions, and fried cheese curds. This was probably the one dog Brandy was looking forward to the most, and it did not disappoint. The sweetness of the onions was a nice contrast to the gamy meat, and the mustard gave a good hit of sourness. The cheese curds on top were really fun texturally, but in the smaller version of the dog that came on the Frank Plank, they didn't add the kind of melty goodness Brandy was hoping for. After that came the Miami Vice, which consisted of a turkey dog topped with braised pork, Swiss cheese, and a pickle. This was probably both Brandy and Bailey's least favorite of the bunch, not because it was terrible, but because in comparison to the other four, it seemed a little bland. The pickle provided a nice bite of sweet and sour, but other than that, there just wasn't a whole lot of flavor or texture to this puppy. Following that came the Sooo Cali, a bison dog on a ciabatta style bun with avocado, tomato, and a pesto aioli. This was the one Bailey had looked forward too, as it's list of fresh ingredients, she thought, would make for a lighter, more refreshing hot dog. The bison dog was probably the most flavorful sausage of the bunch, though it was a little dry (which is to be expected from such a lean meat), but the toppings did put on in mind of a summer day on a California beach. Lastly was the Cincinnati Coney, which came topped with a beef chili, cheddar cheese, and pickled onions. Brandy, who is not a Midwestern native, was not aware that Cincinnati was so famous for its chili, which Bailey seemed to think was highly amusing. This dog was perhaps the most traditional, but also the juiciest and most well balanced. The chili had a nice level of spice, and the onions lent a bit of a bite to counteract the richness of the other ingredients. Finishing off their meal, Brandy and Bailey split a divine creation called simply Chocolate Torte, which turned out to be the most decedent sort of brownie, topped with caramel ice cream, salted caramel sauce, and peanuts. The texture of the torte itself was some where between a pudding and angel food cake, an impossible state of matter that seemed suspended between viscous liquid and airy solid. "They should study this thing in a laboratory!" Brandy exclaimed, "I'm fairly sure this shouldn't exist. But I'm glad it does!" If you, dear readers, decide to visit Bull & Bear for Hot Dog Week, be sure to let us know your favorites by using the tag #RankYourFrank! 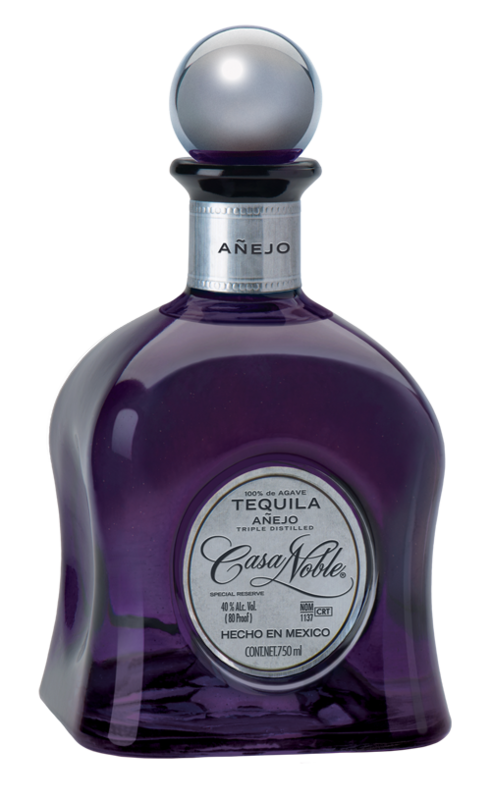 Postcards from Bunny: National Tequila Day with Casa Noble! When Bunny is traveling the world with her husband, Benedict, she does tend to get a little home sick. No, not just for Chicago (though she is constantly craving the burnt crust of a Pequod's deep dish or the snap of a Portillo's dog), but for her home land of England. "It's the tea I miss most when traveling," she says, "As every Englander knows, a good cuppa can fix a whole lot of problems in this world." But how to pair tequila with tea? Luckily, the Casa Nobel Anejo has some very distinct flavor notes of oak, spice, citrus, and vanilla, which lent it well to a floral tea like a hibiscus or rose hips, and as iced tea is pretty popular here in the States, Bunny decided on creating a sort of punch that could be served either individually or in massive amounts ("If Brandy is attending a garden party where liquor is involved, I have to plan enough ingredients to make at least four servings," she thought). Slowly, the cocktail came together until she had a perfectly balanced, light and refreshing concoction that's not too sweet, not too pungent, and shows off the golden flavor of such a high quality tequila to the fullest. Hopefully, all of our readers will try this little beauty out for themselves on National Tequila Day or at their own garden parties! Casa Noble is available locally at Binny's and other fine wine and spirits retailers. The writers of this blog were provided with samples of Casa Noble and compensation for ingredients in exchange for an honest review and the creation of this recipe. Place 3-5 tea bags into a gallon container and fill with warm water. Cover and place in the fridge over night to cold brew. The tea should be a crystal ruby color when fully brewed. Take out the teabags, making sure to squeeze out any excess liquid, and discard. To make the ice cubes: fill an ice cube tray with filtered water (this will create a more crystal clear ice cube) and place a raspberry in the center of each well. Place in the freezer for an hour or more, or until frozen solid. If making a large amount of the punch, combine the Casa Noble Tequila, the honey mead, and the tea in a carafe or punch bowl and stir lightly to combine. Fill a short, wide glass with the raspberry ice cubes, then pour the punch over the ice and garnish with a sprig of fresh mint and enjoy! Note: to make a single serving, simply measure out one shot of the tequila, one shot of the mead, and three shots of tea and sweeten with simple syrup to taste and stir in a martini shaker before pouring over ice and garnishing. As keen eyed readers of this blog will note, last week was the annual Taste of Chicago Festival, and though rains might have dampened the spirits a little on Saturday, there was one very special tent that was new to the festival this year that had Brandy all a twitter (literally, she was tweeting up a storm! ); The Good Life Embassy Presents Olive Oils from Spain. This beautiful little space was providing not only a comfy lounge for tasters to rest up in, but also a charging station for phones, a photo booth, and expert demos performed by none other than one of Spain's premiere chefs, Diego Guerrero, and Benchmark Restaurants' Mark Murphy, who may be recognizable to food fans as one of the more intimidating judges on Food Network's Chopped. Arriving at the tent last Wednesday evening, Brandy found Chef Diego just finishing up his demo of a delicate egg yolk wrapped in a crispy pastry and a chilled cucumber gazpacho, which patrons were lining up to taste. Luckily, Brandy was able to pull him aside from his duties for a brief moment to chat. First, a curious Brandy asked Chef Guerrero about what a typical Spanish breakfast might consist of. "Always olive oil with bread," he told her, "Usually with salt. Sometimes with garlic, a little tomato, or ham. That's a typical breakfast in Spain. It's very healthy; you have the protein, a good fat with the olive oil, and the bread...it's a very good meal for the start of the day." Now intrigued about the Spanish olive oil and what made it so desirable, Brandy quizzed Chef Guerrero a little further. "In Spain, we have more than 2000 different kinds of olives," he said with a knowing smile, "So this makes us one of the biggest producers and consumers of olives in the world. We have a great tradition because we've been producing [olive oil] for many centuries and we've mastered it. The Italians actually buy our olives and they brand them as their own!" Brandy watched Chef Guerrero's eyes wander with wonder over the other stalls of the festival and she inquired if he'd ever been to the Taste of Chicago before. "This is my first time in Chicago," he said, sheepishly, "And I love it!" Eager to recommend some places for him to try, Brandy next asked if he was looking forward to visiting anywhere in particular. "Tonight I'm going to Next," he said, "But I'd also like to taste the most famous burger here in Chicago, because when I'm traveling around the world, I like to visit the markets and taste the local food. This is how I learn." Next, Brandy tracked down Mark Murphy, who had done his demo earlier in the evening, making a salmon tar tar delicately dressed in the olive oil. Chef Murphy was much taller in person than Brandy had expected, ("No wonder they always have him sitting on Chopped," she said, "He's intimidating enough without towering over the contestants! "), but she found him very personable and eager to talk food. "I'm embarrased to say I've not been to the Taste of Chicago before," he whispered to Brandy, "I have been to the Illinois Restaurant Association show though. 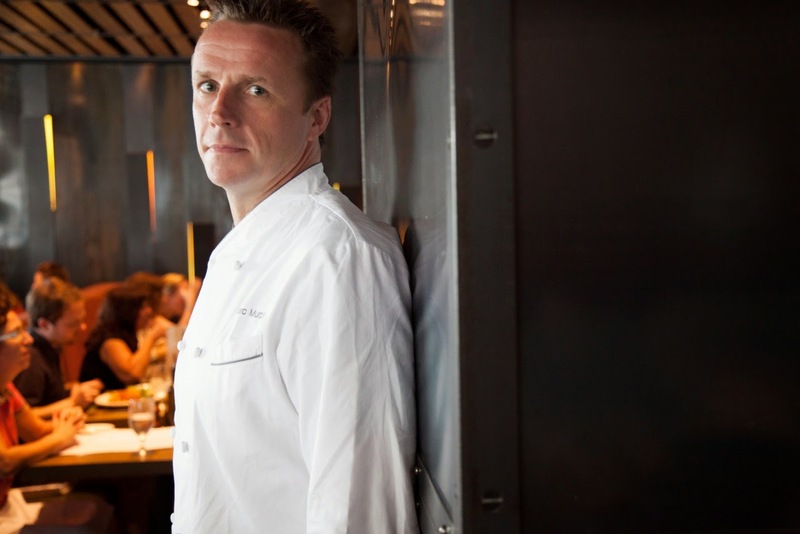 My first time in Chicago, I actually came to go to Charlie Trotter's, which was an amazing experience." When asked if he was looking forward to sampling any restaurants while he was in Chicago, Chef Murphy said, "We went to Purple Pig last night and that was fabulous," but he confessed he wasn't sure where his dinner might come from that night. Asking, as she always does, about his favorite sorts of breakfast treats, Chef Murphy reminded her of his famous Pan Perdu, which he demonstrated on an episode of Best Thing I Ever Made, but also admitted that left to his own devices, he preferred a savory breakfast. "I like a simple egg, fried up in some of this really great olive oil we have here until it's runny and I usually take a hunk of day old bread, run it under water for a second or two to wake it up a little, and make some toast. Pretty simple, but it's just so satisfying to dunk that bread in the yolk." So inspired was Brandy by the chefs and the amazing olive oil they were promoting that she decided to put it to good use and create a little magic of her own once she got home. Taking the idea of a classic olive oil cake and Chef Guerrero's description of a typical Spanish breakfast, Brandy created a moist and healthy olive oil muffin, packed with a favorite Spanish fruit; fresh apricots. Because these muffins contain no butter, but are packed with heart healthy olive oil, they remain succulently indulgent without turning your breakfast into a meal of empty calories. Make sure to let Brandy know if you try these out for yourselves by tweeting us or visiting our Facebook page! In a large bowl, combine the flour,baking powder, baking soda, sugar, and salt. In a second smaller bowl, combine the vanilla, eggs, olive oil, and milk. Slowly add the wet ingredients to the dry 1/2 cup at a time and stir until the batter is smooth and free of any lumps. Add the apricots to the mixture, reserving about 24 pieces to be added at the end, and stir gently to combine. Preheat an oven to 325 degrees and grease a muffin tin with cooking spray (alternatively, you can use paper liners). Fill each cup of the muffin tin with batter until almost full (the muffins will not rise a lot, so don't worry about overfilling). Add a final piece of apricot to the middle of each muffin, then sprinkle with coarse sugar (if using). Bake for 20-25 minutes, or until the sides are golden brown and a tester comes out clean. Let cool for 15 minutes and serve. Now that this little blog is nearing it's fourth year of existence, it's not a surprise to anyone to say that Brandy has eaten quite a lot of brunch. "I don't call myself an expert lightly," as Brandy likes to say, "But if there's anyone in this city whose seen more pancakes, mimosas, or benedicts, I'd like to meet them. And commiserate with them." It is perhaps this very odd set of food expertise that has made Brandy a sought after guest at some of the finest establishments in Chicago who wish to have their brunches ranked among her favorites. Recently, Brandy was contacted by a new comer to the national pub scene (and more specifically, the Chicago brunch scene), Max's Wine Dive in Wicker Park, who have launched their full brunch service of classic dishes, created by their fearless head chef, Jessica Brumleve. Brandy enlisted the help of her friend Bernais Bamboo (a cheerful Sunday school teacher who prefers to brunch on Saturdays, for obvious reasons), as she had previously expressed an interest in studying Brandy's methods of brunch deduction. "It takes a lot to surprise me these days," Brandy told her, sagely, "Which is why I tend towards the original and creative. But if a classic dish is prepared well, I won't be turning my nose up at it. You wouldn't believe the amount of squishy French toast, over done eggs, and watery cocktails I've had in these many years, so as long as it's done right, I'll tip my cap to it." Even the outside of Max's gave off a strategic rusticness with the placement of barrel beside the matte black doorway. Just inside was a wall hung with classic rock album covers, which matched the selection of music playing to the narrow, but sunny dining area. Brandy and Bernais were taken to their seats straight away by a smiling and chatty hostess, who presented them with the menus, which, unusually, contained both the wine list and the food. "The philosophy behind Max's is the pairing of good wine with comfort food, which makes the drinks less intimidating and the cuisine elevated," the hostess told them. "Well, as it's brunch, I can think of no better pairing with our food than a mimosa," Brandy said cheerfully. The hostess smiled. "Of course! Orange or grapefruit juice?" she asked. Brandy raised a knowing eyebrow. "Well played," she said, nodding, "Grapefruit, if you please." "Orange for me," Bernais grinned cheerily. The mimosas were pretty typical, but done perfectly, with a nice quality of champagne that wasn't hidden under the fresh and vibrant juice. Brandy noted with approval that the menu actually gave the diner a choice of bubbly to have in their morning drink. "I like the option to make my mimosa more or less posh," she told Bernais, "No more guessing as to whether the drink you've ordered is really worth the price. It's right there in black and white." Bernais scribbled notes into a paper pad as Brandy spoke. Then the barrage of dishes began to appear. First up was the Whole Wheat Blueberry Pancakes, which came topped with fresh berries, almond granola, and a drizzle of lemon curd. The pancake was a bit on the denser side, but the crunchy granola on top kept each mouth full fresh and exciting. "I find a whole plate of pancakes can sometimes be a little too boring after the first few bites," Brandy said thoughtfully, "But this little bit of texture on top eliminates that kind of problem." Bernais appreciated the brightness that the lemon curd added and that not only were there blueberries on top, but also inside the pancake. "They're like little blue bits of happiness!" she giggled. Brandy surreptitiously moved Bernais's mimosa farther away from her reach. Next up was the Vanilla Bean French Toast, a thick slice of Texas Toast which was topped with macerated strawberries and a pure maple syrup. This was another dish that was pretty standard, but done right, with the tart strawberries cutting through the richness of the thick buttery bread and complimenting the creamy vanilla flavor. The savory dishes started next with the Pork Belly Benedict, which came topped with a giardiniera hollandaise, something Brandy was pretty impressed by. "In all the eggs benedicts I've seen here in Chicago, I've never come across a giardinera hollandaise, and now that I think about it, I can't believe no one else has done it!" she exclaimed. Tucking into the dish, both Brandy and Bernais found they absolutely loved the tangy, vinagared flavor of the sauce, but also the lean and tender pork belly, which had been shredded. Even the basic English muffin that served as the base was perfect, in that it's slight toastiness formed a sturdy yet pliable pedestal on which to carve a masterpiece. Following that was the Biscuits and Gravy, which buried the headline a bit, as the center piece of the dish was a chicken fried flat iron steak. The buttermilk biscuits were tender, but dense, with an almost cheesey flavor, while the gravy was nicely spiced with a hint of fennel from the sausage. The steak, while tender, was a bit too thin for its thick coating, and got a bit overshadowed by the tasty, crunchy batter. "It's so yummy, but I can't help feeling it's like a bride being upstaged by her maid of honor," Bernais said, and Brandy quite agreed with her. For the final course ("Thank goodness!" Brandy breathed, "I'm so full of food I'm ready to make myself a little too comfortable here and lie down for a bit! "), a server presented them with a plate of Max's signature Fried Chicken with collard greens, home fries, and another thick slice of Texas toast. Brandy and Bernais first split the giant breast, which proved to be incredibly juicy on the inside. Here, the thick layer of batter, which had a bit of a kick to it from some added jalapenos, was much better served, proving to be a compliment rather than a cover for the protein, and the side of chipotle honey, which the menu listed as optional, was a definite must in Brandy's opinion because of it's smokiness. The bed of greens beneath the chicken had a pungent tanginess to them, which both helped to center the decedent chicken, but also added a good punch of flavor to the otherwise subtle potatoes. "So what did you think?" Bernais asked as the two ladies waddled away from the restaurant, "Was it worthy of your approval?" Brandy gave a slow nod. "The food was classic and satisfying with some very nice original touches," Brandy stated matter of factly, "And sometimes even I tire of invention for invention's sake. There are a fair few establishments in this town that would rather put something insane on a plate without first making sure that it's tasty, but this spot is not one of them. This is a place that knows its brunch classics and only improves upon them when they feel they've mastered the basics." "But I heard one of the ladies that worked there say something about a Saturday Cartoon Brunch. She said they would be serving bacon stuffed pancakes and cereal topped pancakes and pizza bagels and gigantic sundaes. That sounds pretty creative to me!" Brandy stopped in her tracks. "When is that happening?" she asked. Bernais blinked, confused. "Saturday the 12th, I think." A moment latter, Brandy was marching back towards Max's in order to make her reservation for the following weekend. The writers of this blog were invited by the restaurant to dine at no charge in exchange for an honest review.